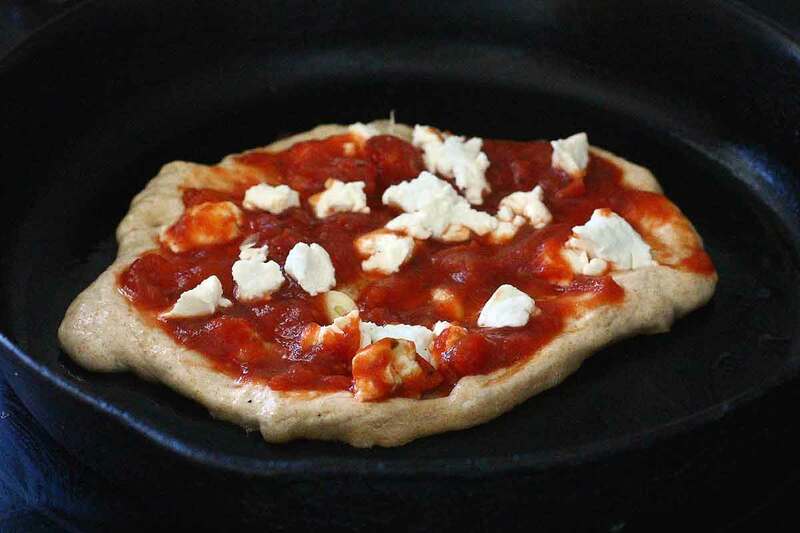 Individual goat cheese stove top cast iron pizzas—because there is always a choice that doesn’t involve ovens or takeout. I don’t know what restaurants in your part of the world charge but around here a crappy takeout pizza will cost you about six dollars and a good one starts at thirteen or more. If you want it gluten-free add another three or four dollars. Too much for me. So normally we make our own pizzas but the oven and I are having a hot weather stand-off right now. Not happening. I keep a batch of dough going in the fridge and fry up bread as we need it for toast or sandwiches. It’s not pretty but it’s always fresh and I get to leave the oven out of it (or is that it out of the oven?). This is the sort of recipe to be slap dash about. 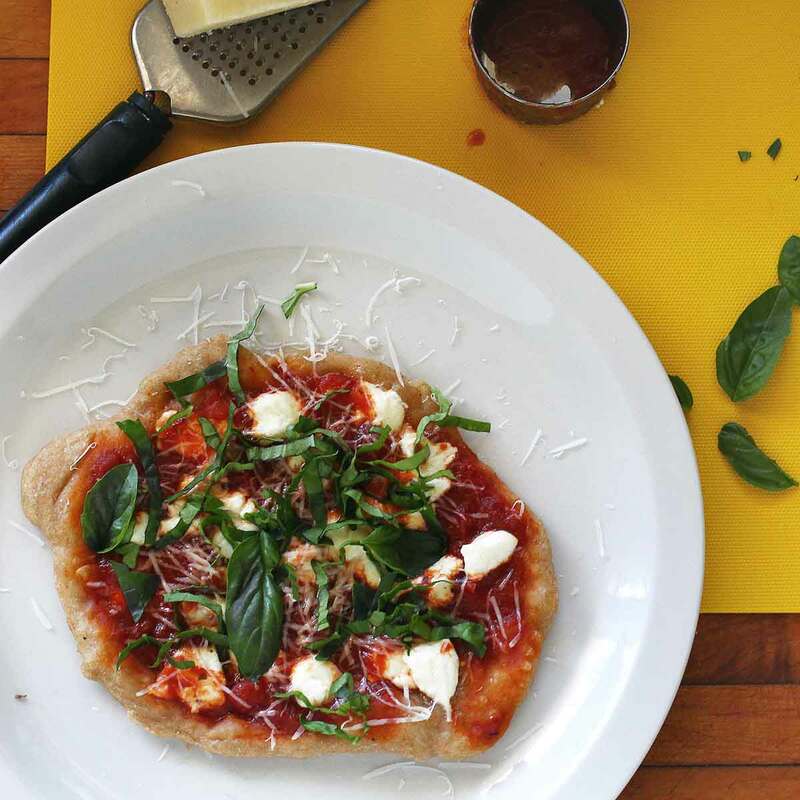 It is a pizza after all, an ode to improvisation. 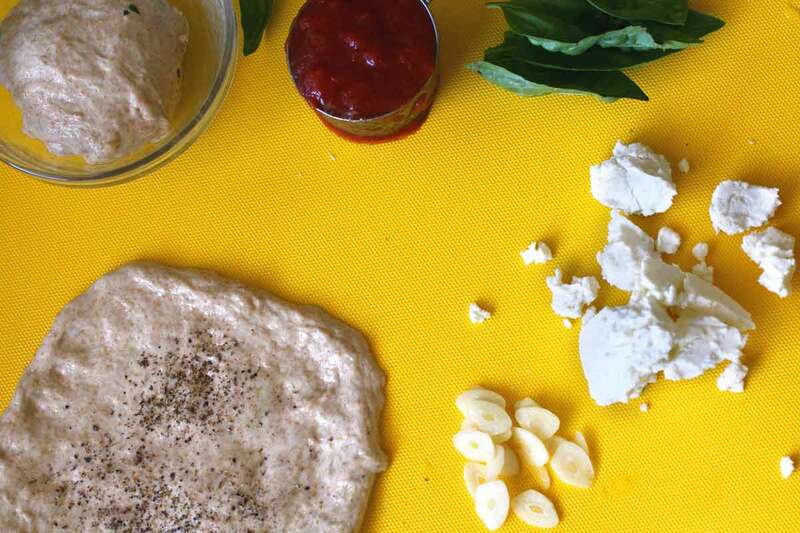 All you really need is dough but dough is not all you need. Some sauce. A bit of cheese. With the carnivore out of town we’ve been eschewing meat most nights but two of these pizzas and a salad is more than satisfying. 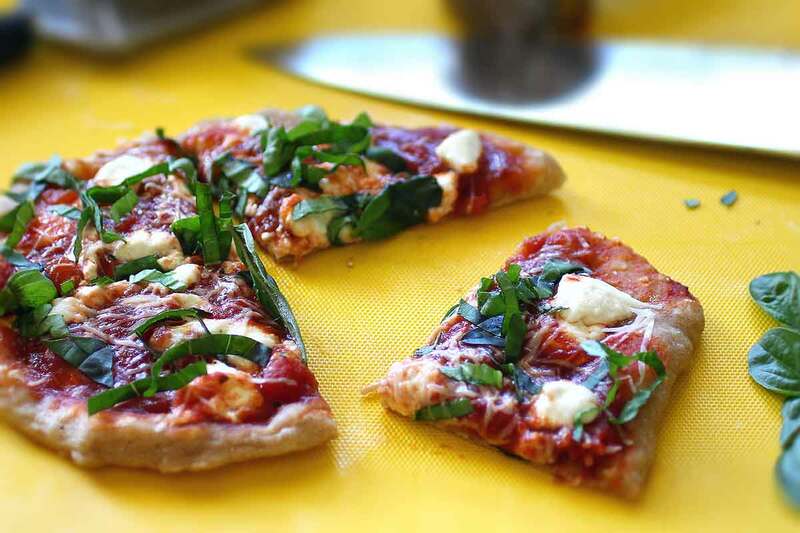 Your cook times may vary depending on the thickness of your crust but about ten minutes is all you need. The dough can come straight out of the fridge. If you are working with a particularly wet dough or a gluten-free mix you might want to form the pizza in the cast iron and then add heat. As long as the pan is well seasoned and coated with a bit of oil I’ve never had a problem with sticking. Make sure your ingredients and pan are all prepped and ready then roll or spread out the dough to your desired thickness. My dough tends towards the wetter side so I usually preheat the pan over a low heat, roll out the dough, add the garlic and some pepper flakes, place the dough in the pan and then add the sauce and cheese. Cook covered over medium low to low heat until dough is cooked through and a deep golden brown on the underside, sauce is bubbling, and the cheese has melted. Remove from heat and top with parmesan and basil. Make sure your ingredients and pan are all prepped and ready then roll or spread out the dough to your desired thickness. My dough tends towards the wetter side so I usually preheat the pan over a low heat, roll out the dough, add the garlic and some pepper flakes, place the dough in the pan and then add the sauce and cheese.